If you met a little gray man on a sunny afternoon and that little guy wanted to see the highlights of earthling life, what would you show him? We know, it's a hard question. There are so many factors! Has this alien been to earth before? Will people recognize him as extraterrestrial or is he going to wear a straw hat and large sunglasses? Does he have a sense of humor or is he concerned with taking valuable human data as part of his job? And most importantly, do you and your new cosmic pal have access to his lightning-fast UFO? If so you two could lunch on Poboys while listening to brass bands on the sunny cobblestone streets of New Orleans at one o'clock and be dancing in an underground club in Istanbul before midnight. While it's unlikely that a little grey man will ask you to play tour guide to earth anytime soon, your chances are sure to go up when you're dressed like his people! 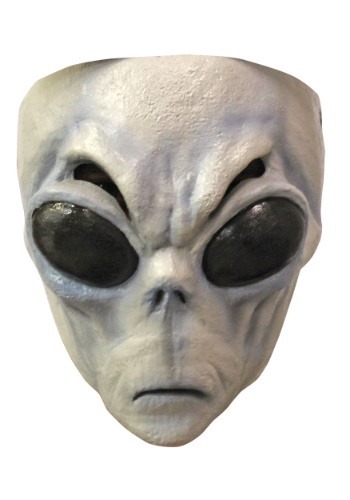 You'll look like you just landed on this green planet when you throw on this gray alien mask. Driving any vehicle, including unidentified flying objects, while wearing this mask is discouraged due to peering at the world through eye slits. However, the eyes under your human ones look like they could see in total darkness as they are glassy and oversized, just as we'd expect! The ensemble you could put together with this mask is as varied as the activities you could do with a little gray man on a sunny afternoon! You could look like a businessman from outer space when wearing a suit or an intergalactic tourist learning to party like a human when wearing a Hawaiian shirt. Hey, you could even wear a silver bodysuit if you want to embrace a space-age kind of style! So, welcome to earth and buckle up, anything can happen here!